Do You Have A Zoya Account? No? Get One. Promo Time. Zoya has been having some amazing promos recently. This is a formal thank you to Zoya from Beautyburg for that. 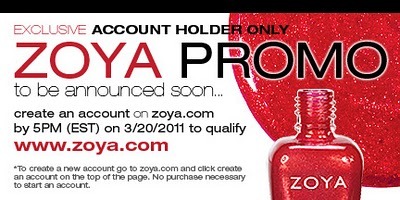 But they have been hinting this past week that something truly awesome was up their sleeves for Zoya account holders. So don't have an account? It's easy. Go to www.zoya.com and make one by tomorrow 5pm EST. Then we will wait and see what happens! To keep up with Zoya, try one of their many media outlets. More Zoya bottle shots from a recent haul. If you missed Part 1, click here. Special thanks to Ange at Scandalously Polished. Her post, click here, was a major contributing factor into shade selection for my haul. Left to right: Cheryl, Glora, Kym, Crystal. Cheryl - a dark cherry with pewter, copper, wine duochrome shimmer. This one is like if Cola and Valerie had a baby. I really have to try this one on. Gloria - pretty metallic mauve pink with golden and magenta duochrome. Kym - a coppered metallic red with red, pink shimmer. Kym, you are beautiful, though your name is spelled in a typical Zoya flare. Crystal - soft royal blue with golden and silver duochrome shimmer. Now this reminds me of brocade. I know that was the goal of Rescue Beauty Lounge's Tudors collection. But Crystal is straight-up brocade in my mind. Cremes! I don't really own enough creme shades. Left to right: Casey, Maura, Asia, Cola. Casey - a vampy, dark brown purple jelly. This was one that made me drool from Ange's swatches at Scandalously Polished. This is on the *top* of my "to-try" list. Maura - a bright, slightly vermillion warm-toned red. Stephanie at Imperfectly Painted did a post on this color recently. Click here to see it. It looks pretty on her. Asia - another red creme. Cool toned, dark velvety rose red. Cola - warm cherry brown. This is what Cherry Coke would like if it were a nail polish. I think I am going to love this one. All polishes are available at Zoya.com. Again if you missed Part 1, click here. More delicious Zoya spam to be enjoyed. Swatches to come soon! Long before I fully immersed in nail polish, I had known about Zoya. I had ordered a few bottles after reading about the brand in a magazine. At that time, I was deeply into makeup and fragrance (which I'm still into) but never spent much time caring about my nails. Most days, I would go unpolished and unfiled. When I had first received my first Zoya haul, early 2008, I definitely noticed that there was a difference in the quality and application of these polishes. I hold Zoya responsible for peaking my interest in lacquer. As you can imagine, it's been a downward spiral from that moment. I took advantage of a recent sale at Zoya to catch up on recent collections that I had missed out on. If you don't follow Zoya's blog or Zoya's twitter, I highly recommend doing so. It's the best way to get the latest info on upcoming promotions. Here are some bottle shots of my haul. I will definitely be doing swatches of all of these over time, but the difficult question is which one first? Nidhi - duochrome pink, purple, yellow, orange. Jade -looks like a jelly in the bottle? Gotta try it on. Jade - Red with red microglitter. This one was hard to photograph, but I hope you can get a sense of the texture from the bottle. Karina - cool metallic wine red foil. Carrie Ann - pink/red foil with copper shimmer. Julieanne - Joker purple duochrome with violet, green, sapphire shimmer. Roxy - deep magenta jelly with grape candy colored glitter. Valerie - super cool-looking violet duochrome with copper, gold, green shimmer.